After a long break of 26 years, legendary actor Amitabh Bachchan has teamed up with Rishi Kapoor for a film directed by Umesh Shukla “102 Not Out”, which is based on a Gujarati Play written by Saumya Joshi. 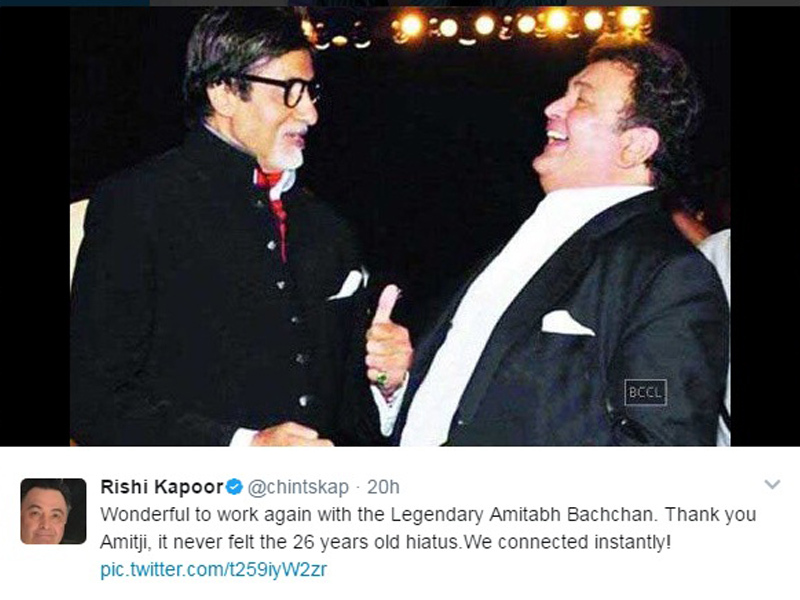 Bachchan and Kapoor have shared screen space in hit movies like “Amar Akbar Anthony”, “Coolie”, “Kabhi Kabhie” and “Naseeb”. The film revolves around a 102 year old man who tries to break the world record of the oldest person alive and what makes the film interesting is that Amitabh Bachchan will be playing a 102 year old father to a 75 year old son Rishi Kapoor. Currently the team is shooting for the film in Mumbai and the movie is slated to be released in April 2018.